View More In Food Processors - Page 4. 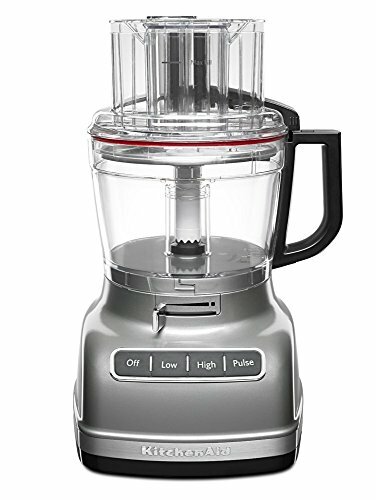 The KitchenAid 11-Cup Food Processor with the exclusive ExactSlice system, slices from thick to thin with one slide of the lever. The multiple optimized speeds and distinctly designed stainless steel blades help in prepping food. Slice, shred, knead, puree and chop food quickly and easily. The externally adjustable ExactSlice System features optimized speeds, and an external lever that allows you to go from thick to thin with one slide of the lever. The 3-in-1 Wide Mouth Feed Tube lets you accommodate large items - like tomatoes, cucumbers and potatoes with very little prep beforehand. The UltraTight Seal Features a specially designed locking system with leak-resistant ring that allows you to fill the work bowl to capacity with ingredients without worrying about making a mess. High, Low & Pulse speed options allow you to precisely and properly handle soft or hard ingredients with the touch of a button. If you have any questions about this product by KitchenAid, contact us by completing and submitting the form below. If you are looking for a specif part number, please include it with your message.